Springfield's Range Officer Elite Compact 9mm is one gun that can do it all. For a long time the 1911 universe was pretty easy: You bought or built a full-featured, full-size pistol for competition. Then you bought a plain-Jane beater for daily carry. The competition gun was tricked out with all the features. It was brilliantly accurate, all-steel and won matches for you. The carry 1911 was worn, gray, a lightweight aluminum frame and it was often rattly loose. If it was better than "minute of felon" accurate, we were happy. Oh, and they were both chambered in .45 ACP. Springfield Armory changed that a few years ago with the Range Officer. It is a plain 1911 built to competition specs in fitting and delivers like a match gun. No extras, no cosmetics, but all the performance of a competition gun without the big price tag and the long lead times for custom work. Now Springfield has unveiled its new Range Officer Elite lines, four guns available in both 9mm Luger and .45 ACP. The two full-size ones are made with steel frames, and the two smaller ones are made with aluminum frames. The Elite Target has an adjustable rear sight, while the rest have fixed sights. The sample I received was the 1911 Range Officer Elite Compact in 9mm. The Elite Compact comes with a four-inch barrel and a slide to match. The barrel is stainless steel, match grade, with an integral feed ramp for better case support. If you are in the habit of using +P or +P+ ammunition, the supported chamber of the Elite Compact will serve you well. For the rest of us, it simply means the brass is better supported and thus less hammered in use. Resizing it for reloading will be easier. The 9mm barrel is of bushing-less design, and Springfield's manufacturing folks did it right because it's a great-shooting gun. The front sight is a fiber optic set in a dovetail. The Elite Compact does not use a barrel bushing. Instead, the front of the barrel is turned to a large-enough diameter that it will lock onto the front of the slide without a bushing. Behind the lockup area, the barrel is sculpted on the top surface to provide clearance for slide movement. While this design eliminates the need to machine and fit a bushing, it does require the recoil spring retainer be of the "reverse" design- installing from the breech end, not the muzzle end. The retainer rides on a full-length guide rod, which is itself surrounded by the recoil spring. On the Elite Compact the recoil spring is a flat-wire captive design for longer service life and also because a flat spring takes up less room. That allowed the Springfield designers get more spring in the same space, which is good for both service life and reliability. The Elite Compact's rear sight is shaped so it can be used to rack the slide in an emergency. The beavertail grip safety features a memory bump, and the good-looking G10 grips provide a non-slip purchase. The rear has the front face machined to provide a smooth but vertical surface, so if you have to clear a malfunction one-handed (the sign of a really bad day) you can do so by hooking it on the edge of something and pushing forward. The rear sight has a pair of white dots flanking the notch, while the fixed front is a steel blade with a fiber optic tube inserted through it. The base of the front sight is neatly finished to match the curve of the top of the slide, and it blends in so well you might not notice it at first. Should you not find the sights to your liking, they are in standard dovetails, and there is no end to the aftermarket sight makers who would be happy to provide you with replacements. The rest of the slide is pure Springfield- with a lowered and sculpted ejection port, the Springfield name and logo on the right, and "compact cal 9mm" on the left. Just in case you had any doubts, the right side, behind the standard Springfield serrations, is where the slide is laser-etched "RO Elite." The frame is aluminum, with the area under the chamber machined for clearance of the integral ramp. It has a smooth frontstrap and a checkered mainspring housing. What is interesting about the Compact is the bottom of the grip has been shortened by half an inch. This requires a shorter magazine in order for the magazine to be flush, which costs you a round of capacity. But it does not preclude the use of full-length magazines. They'll just stick out. I found the shorter grip to be the "Goldilocks" length. It was shorter than the usual Government or Commander, length, but it's not so short my little finger was just flapping around in the air. I could get all fingers on the grip, and this helps greatly in recoil control. The trigger- the new Springfield Gen 2- is aluminum, lightened even more with sections cut out, and it provides a clean trigger pull when combined with the Springfield Commander hammer. I often find that the right side paddle on ambidextrous safeties interferes with my grip, but this one did not. The grip safety is upswept and provides a clearance cradle for the Commander hammer's loop. It also has a speed or memory bump on the bottom. That extra part of the grip safety ensures your hand depresses the grip safety when you want it to. Because the grip is half an inch shorter than a standard 1911's, full-length mags will protrude from the base. But they will still work. The G10 grips are flatter than the usual 1911 grips, something I particularly like. They are also machined with an aggressive pattern that keeps your hands locked to the grips when shooting. The light and dark alternating layers of the G10, when machined for the non-slip grip, provides an interesting and understated pattern that contrasts with the flat matte gray/black of the metal's Black T finish. The combination of all these features made for a pistol that was both good looking and a pleasure to shoot. The aluminum frame brings the bare weight of the pistol down to 29.5 ounces, which will not be a drag on your belt. And yet felt recoil was no big deal. Even with the hottest defensive loadings, the Elite Compact was well-behaved. It was also accurate without a fault. Usually, when I test a handgun with up to a dozen different loadings, there will be something the gun doesn't like. Not so with this little gem. It fired tight groups of boring consistency. The recoil spring is flat, formed from a ribbon of spring steel instead of wire. You have to capture the spring with a paper clip during disassembly. The only complexity is in disassembly. You'll need a bent paperclip to hook into the hole in the recoil spring guide rod. When the slide is back, place the end of the clip in the hole. Ease the slide forward until it stops. You can now disassemble normally, and extract the captured spring and guide from the rear of the slide. The soft recoil of the Elite Compact got me to thinking: What about the other models? The Elite Champion is two ounces heavier and has a full-size frame. The Elite Operator and Elite Target both have steel frames, and the Elite Operator adds an accessory rail. They weigh 41 ounces, and at that weight, there is no 9mm loading in existence that will cause you any discomfort. The longer sight radius would also make you a more accurate shooter. But, for me, the Elite Compact is the one to have, the one that fits the most shooting needs. As a training tool, the RO Elite Compact is comfortable to hold, soft in recoil, accurate, and has a great trigger. If you have a new shooter, start them with a .22 LR, then transfer them to this. If you feed the Elite Compact some really soft 9mm reloads- or the lightest-recoiling 9mm factory you can find- they will have fun. They will not be beaten-up by recoil, the muzzle blast won't be a big deal, and best of all, they'll hit what they are aiming at. You'll reap the same benefits. As a competition pistol, it conforms to the equipment rules of USPSA Limited, Limited 10 and Single Stack. 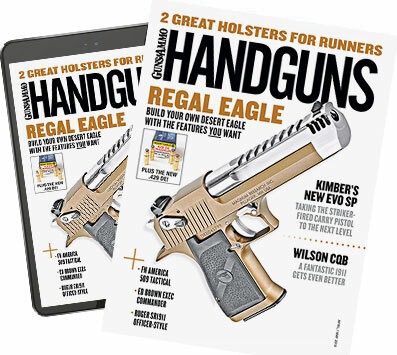 While you may be giving up some advantage to someone using a full-size, all-steel pistol, it won't be much, and you'll be far the better shooter for using your actual carry gun in a match. For those who shoot IDPA, it would seem the Elite Compact was made for the Compact Carry Pistol division. I t has what you need for shooting in a match, although I'd be tempted to install a magazine funnel on the Compact for competition. The magazine well is beveled as it comes from the factory, but for match use, you want something really big. Depending on the style of funnel, it might not even have to come off for everyday carry. Is it an everyday carry gun? It is light, so it won't weigh you down. It is compact, so it won't be wearing on your hip, back, arm or other body parts because it won't be rubbing. Since it is a 1911, pretty much anyone who makes a holster will be making a model for this one. Ditto spare magazine holders. So, yes, the Elite Compact certainly qualifies for everyday carry. In short, the Range Officer Elite Compact fits every need you might have- except maybe stopping a charging bear. And with a price tag right at a grand (street price will be less), I don't see how you could go wrong.